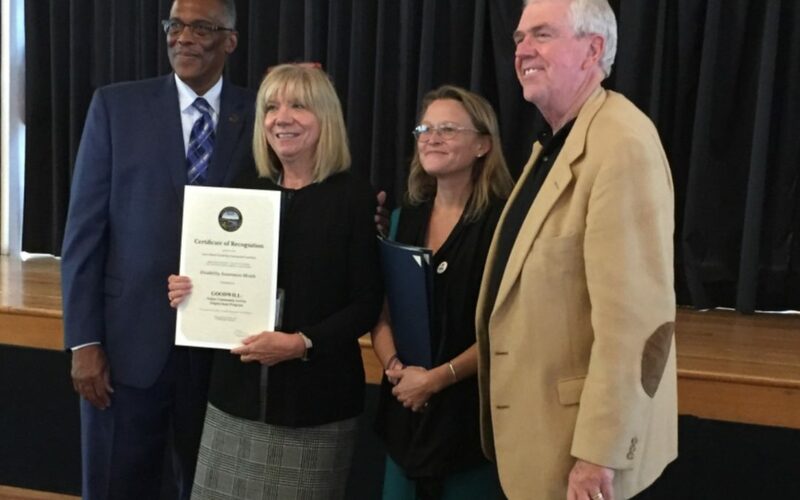 Chattanooga Goodwill joined other area businesses at the Bessie Smith Cultural Center to kick off National Disability Employment Awareness Month (NDEAM), which is the month of October. NDEAM celebrates the contributions of workers with disabilities and educates about the value of a workforce inclusive of their skills and talents. The kick-off luncheon was coordinated by Chattanooga City Councilman Erskine Oglesby, along with the City of Chattanooga Office of Multicultural Affairs, the Chattanooga Area Employment Consortium and the Mayor’s Council on Disability. The councilman said he wanted to celebrate city businesses that make it a point to employ people with disabilities: Chattanooga Goodwill, CARTA, YMCA, Aramark, Memorial Hospital, Food City and Integrity Staffing. Oglesby said he has a personal interest in and appreciation of businesses that hire people with disabilities. A YMCA (located in another city) hired his son, who has autism, several years ago. “I know how important it is for every citizen who has a disability to have a meaningful life and that includes work and having a job,” he said. Chattanooga Mayor Andy Berke also thanked the businesses represented and stressed the value of hiring people with disabilities. To truly boast about a good economy means “we can talk about how the economy works for everybody in the city. That’s what being inclusive is all about,” he said. Jeremy Norden-Paul, the state director of Employment and Day Services for the Tennessee Department of Intellectual and Developmental Disabilities, was the keynote speaker. Working, he said, is a public health benefit, is socially valuable and, most importantly, is a civil right. “All people who are capable of working deserve the right to do so. There are no exceptions. It is critical to one’s life.” Companies, such as Goodwill and the others celebrated at the event, are instrumental to the cause of creating equal access to jobs. To round out the month, CARTA will host a job fair on Monday, Oct. 29, from 11 a.m.-2 p.m. at the Ray Evans Transit Center, 740 E. 12th St., Chattanooga. People interested in attending should bring a resume and can call 423-698-9038 to sign up and book a ride. Chattanooga Goodwill employs more than 400 people throughout SE Tennessee and NW Georgia. More than 15% of our workforce are people who have disabilities or other barriers to employment. Explore our current employment opportunities.